Puma markets itself as a company that cares about equality yet it funds the apartheid the IFA helps sustain. In July 2018 it was announced that Adidas was no longer sponsoring the IFA following an international campaign and the delivery of over 16,000 signatures to Adidas headquarters. We can do this again. 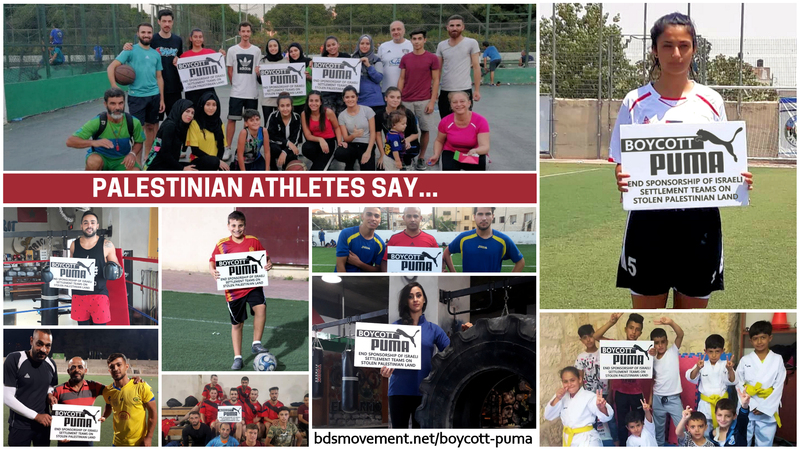 Join Palestinian athletes calling for a boycott of Puma until it ends its support for Israel’s illegal land grabs. As one of the world’s top athletic apparel makers and the only international sponsor of the Israel Football Association, Puma’s sponsorship brings international legitimacy to the IFA’s actions. The IFA, as documented by Human Rights Watch, includes football clubs based in illegal Israeli settlements on occupied Palestinian land. 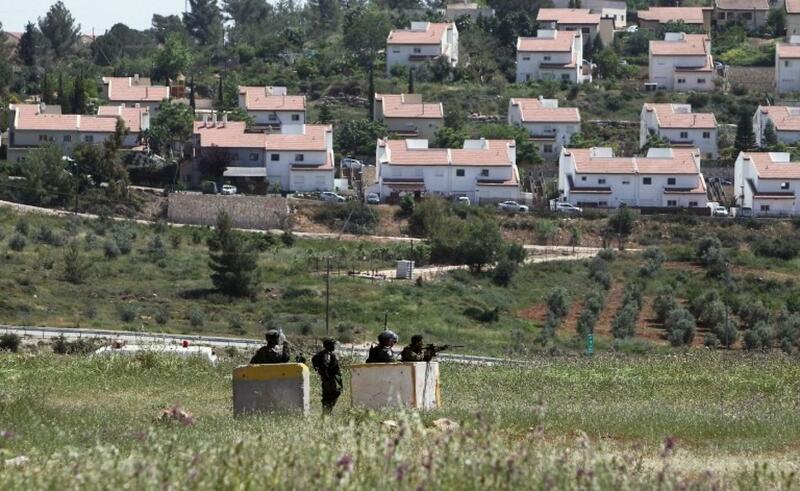 Israeli settlements are illegal land grabs that form an integral part of Israel’s occupation infrastructure pushing indigenous Palestinian families off their land, robbing Palestinians of natural resources and denying Palestinians their right of movement. Puma’s sponsorship of the IFA helps keep its direct involvement in violations of human rights and international law off the field, allowing Israel’s settlement regime to continue and expand. The IFA has refused to take measures to end its complicity, despite being repeatedly condemned by UN advisors, dozens of elected officials, civil society and human rights groups representing millions and public figures. It’s time for Puma to abide by its stated commitment to human rights. The Israel Football Association includes six Israeli football clubs located in Israel’s illegal settlements built on Palestinian land occupied by the Israeli military. Israel’s settlements contribute to serious human rights abuses and are a direct cause for restrictions on Palestinian freedom of movement, access to natural resources and ability to build homes and conduct business. UN Security Council Resolution 2334 (2016) reconfirmed the illegality of Israeli settlements, denouncing them as “flagrant violations” of international law. Together with Israel’s illegal wall, military checkpoints and Jewish-only roads, the settlements form part Israel’s occupation and apartheid infrastructure that systematically obstruct every aspect of Palestinian life, including the practice of sports. Puma is the IFA’s only international sponsor. Puma’s global brand recognition gives legitimacy and international cover to Israel's illegal settlements and its continuing violations of international law and Palestinian human rights. Israel uses sports to prop up its failing image and normalize its war crimes and egregious human rights violations against Palestinians. Palestinian athletes are regularly prevented from training and participating in competitions, at home and abroad. Israel has bombed and destroyed Palestinian stadiums and sports structures and routinely denied freedom of movement to Palestinian athletes. It has imprisoned and shot Palestinian athletes, and killed Palestinian children playing football, more than once. 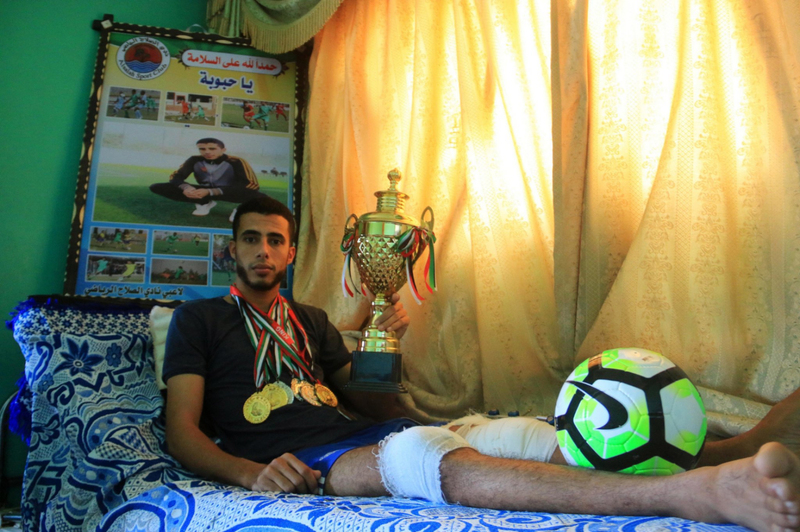 In 2018 alone, Israeli snipers ended the careers of dozens of Palestinian athletes in Gaza, firing on peaceful protesters participating in demonstrations for an end to Israel’s siege and their UN-sanctioned right of return. A UN Commission of Inquiry found that Israeli soldiers intentionally targeted Palestinians participating in the demonstrations, actions amounting to war crimes. The IFA has lobbied FIFA continuously against accountability for Israel’s assault on Palestinian sports working hand-in-hand with the Israeli government to block Palestinian accountability measures. The IFA is complicit in Israel’s crimes against Palestinian sport. Palestinian sports associations and athletes have called on Puma to end its sponsorship deal with the Israel Football Association. More than 200 Palestinian football clubs and sport associations sign a letter calling on Puma to end its sponsorship of the Israel Football Association due to inclusion of teams based in illegal Israeli settlements on stolen Palestinian land. 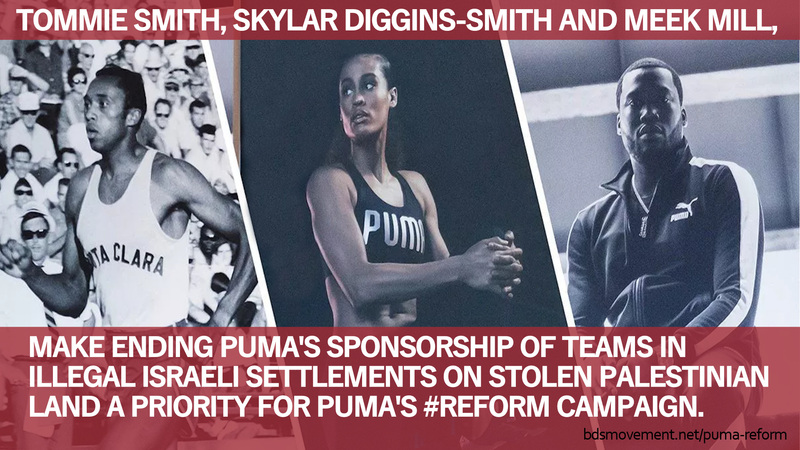 Over 1100 tweets subvert the launch of Puma’s #Reform campaign, denouncing Puma’s hypocrisy in promoting “universal equality” and “social justice reform” while sponsoring teams in illegal Israeli settlements that push Palestinian families off their land. Palestinian sports figures launch call for boycott of Puma, including Palestinian Women’s National Football Team player Aya Khattab, marathon runner Mohammad Alqadi and the Islami Ramallah Men’s Football Team. 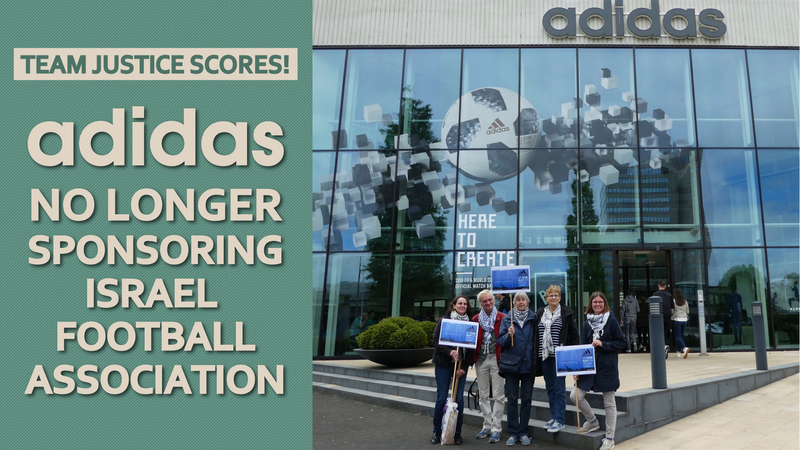 In July 2018 it was announced that Adidas was no longer sponsoring the IFA following an international campaign and the delivery of over 16,000 signatures to Adidas headquarters, setting a precedent for the campaign. Puma banks on its brand image. Grassroots campaigning and boycott actions can put pressure on the company to end its involvement in Israel’s violations of international law. Involve local sports associations in your campaign. 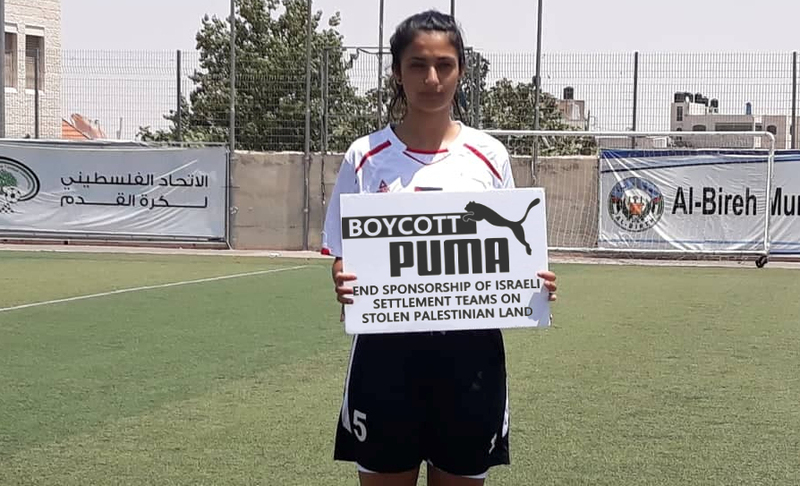 Palestinian sports clubs and athletes are calling for a boycott of Puma until it ends its sponsorship of the Israel Football Association, which includes teams in illegal settlements on occupied Palestinian land. Help us spread the word! There are BDS partners all over the world who are working to campaign for a military embargo and against all forms of military cooperation with Israel and Israeli military companies. Get active and connect with one now! Join the international day of action on June 15 to demand Puma end its support for illegal Israeli settlements on stolen Palestinian land. Take action at Puma shops, Puma offices or offices of Puma-sponsored teams. Let Puma know you will respect the call from Palestinian athletes to #BoycottPuma until it ends support for illegal Israeli settlements pushing Palestinian families off their land. Take the pledge. Deliver the letter from Palestinian clubs to Puma offices. Get creative. Organize a mock football match or sporting event at a Puma shop. Use Puma’s store locator to find Puma branded shops in your city. Ask fan clubs, sports associations, popular teams, anti-racist tournaments and sports figures to show their support for the campaign with a photo or social media post with the hashtag #BoycottPuma. Ask them to support the Palestinian call by pledging not to use Puma equipment. Monitor this list of Puma twitter accounts for information on public events. Urge organizers to refuse Puma sponsorship. If they fail to do so, organize a creative protest at the event.